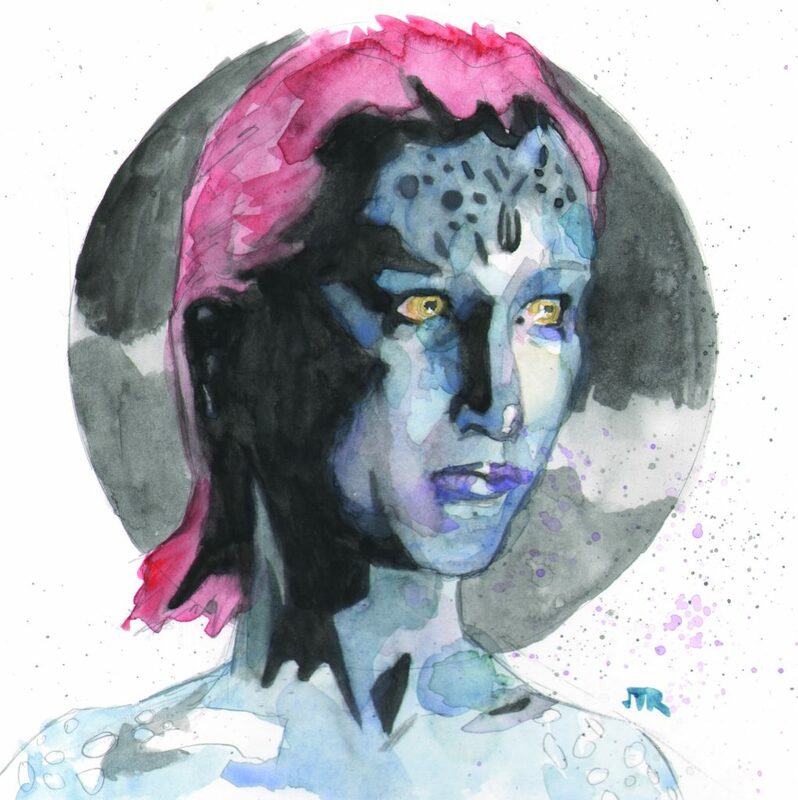 Here is X-men number 2 for this week, Mystique. While she was a bit player in the world of mutants, in the comics, the movie universe has changed that. The other big change was her look. While always blue, she was not so naked or scaley. 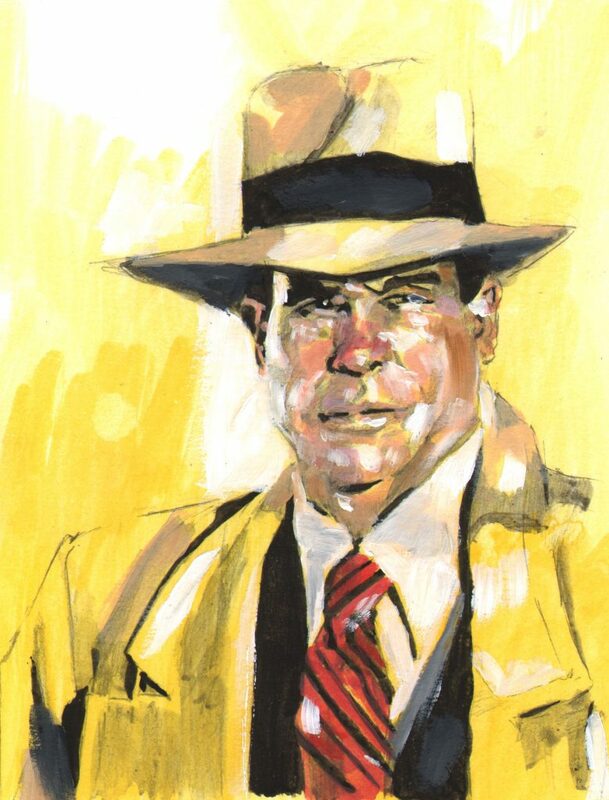 This is a painting on illustration board and with gouache paint. For the next X-Men character we will be going away from the traditional painting and go into the digital paint world. 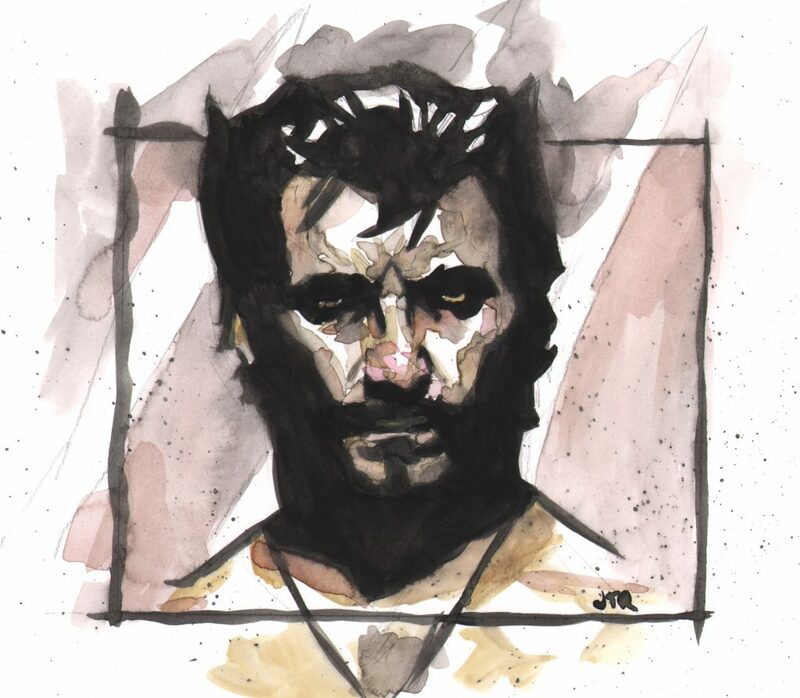 In preparation for seeing the new X-Men movie today, I decided to do some quick portraits of some of the characters from the more recent films. And how do you not start off with the top X-character, Wolverine? For me he is the best character in these films. Hugh Jackman plays Wolverine perfectly for me. He can play him as a crazed killer and bring it right back to guy who can drop a funny one liner and it all works. Wolverine isn’t really in the comics anymore so this is the one place I can still get my fix. This painting was start to finish about an hour long and was painted with gouache paint on illustration board. It is 8″x8″. I filmed the whole process and should have a speed painting video to share with everyone soon. I am a big fan of Jim Henson and many of his creations and have grown up always loving the Muppets. And, doing artwork of the Muppets is not a new thing for me. I really enjoy creating art from these characters, be it Muppets or characters from the Dark Crystal or Labyrinth. I just realized that I have been ignoring the characters from Fraggle Rock and I should probably do something about that! Muppet portraits will be one of the subject matters for me during this 30 day challenge. Starting off with Fozzie is a great place to begin. 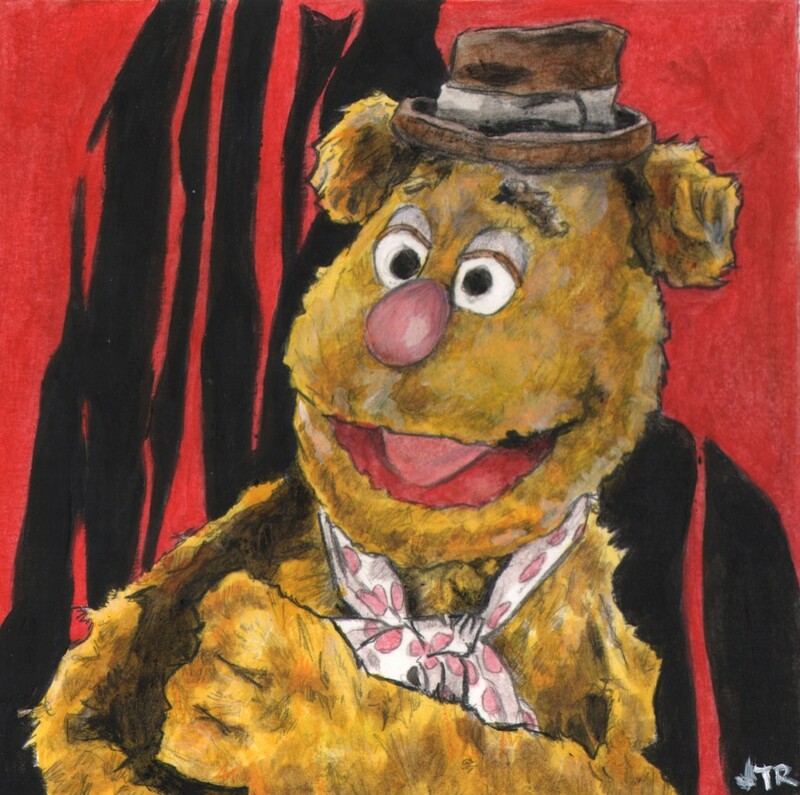 If I were to rank my favorite Muppets I think Fozzie would be right near the top. While his jokes are typically groan worthy, he is very lovable. First off, visually, I love his texture. His fur is crazy. And he rocks the polka dot scarf! I also remember him having issues with people throwing bananas at him which has not been a subject that has been brought up recently. On the outside he is a crazy guy saying “wocka wocka” and getting up on stage to tell jokes, but on the inside he is very self conscious. I think artists can relate to putting your work out for everyone but being very self conscious about it. 8″x8″ oil, inks and colored pencil on illustration board. This is the first painting for the 30 Paintings in 30 Days challenge on artist, Leslie Saeta’s blog-http://30paintingsin30days.weebly.com/blog. 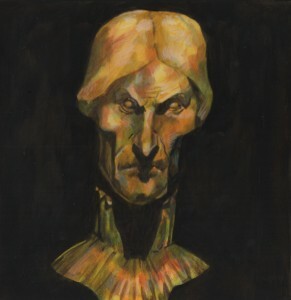 And the subject of day 1 is of one of the busts found in the changing portrait hallway in Disneyland’s Haunted Mansion. I’m a huge Disneyland fan and the Haunted Mansion is one of my favorites. And it, along with Disneyland, will be a subject that I will be coming back to during the challenge this month. With the challenge I am trying out a new process for most of these paintings. 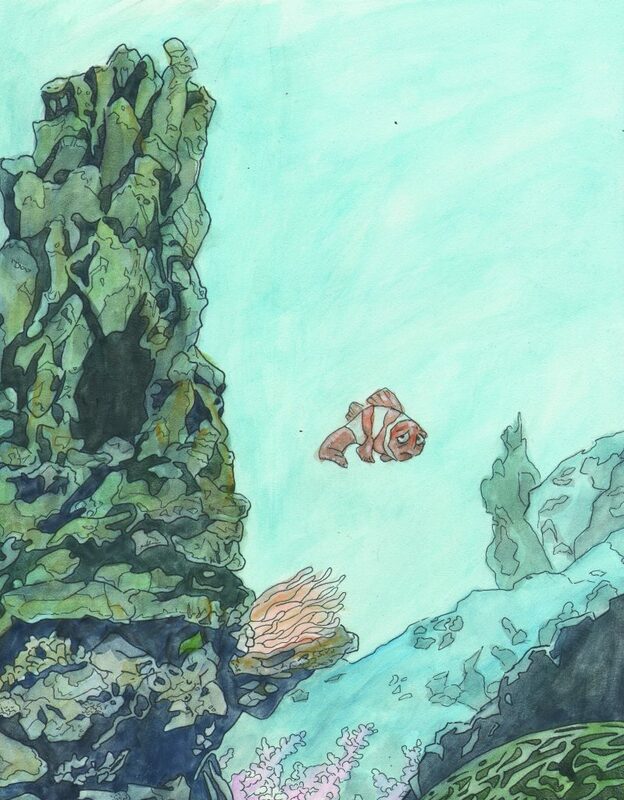 Lately I have been doing mostly watercolor paintings with ink pens or painting with gouache. But, for this painting I used acrylic ink and oil paints. I started by using the acrylic ink for many thin washes. In between washes I would use white charcoal pencils for highlights and colored pencils for some shading and streaks of color. To finish it off, oil paints were applied. This was my second attempt at this technique. And I find myself enjoying it. The layering process does add more time to the whole thing. In the past I feel like I try to work fast and finish things quickly but I have felt like I need to slow down and take more time with my pieces. I will be using this process more through the month with a few attempts with watercolor pieces to see what reaction I might get from those. As for subject matter of the pieces I will be doing, I plan on more Disneyland pieces along with Muppet characters and doing some portrait works as well. I like the idea of trying some different kind of subjects to test myself and stretch my wings a bit. I hope to get some comments about the direction I’m going or about the subject matters. 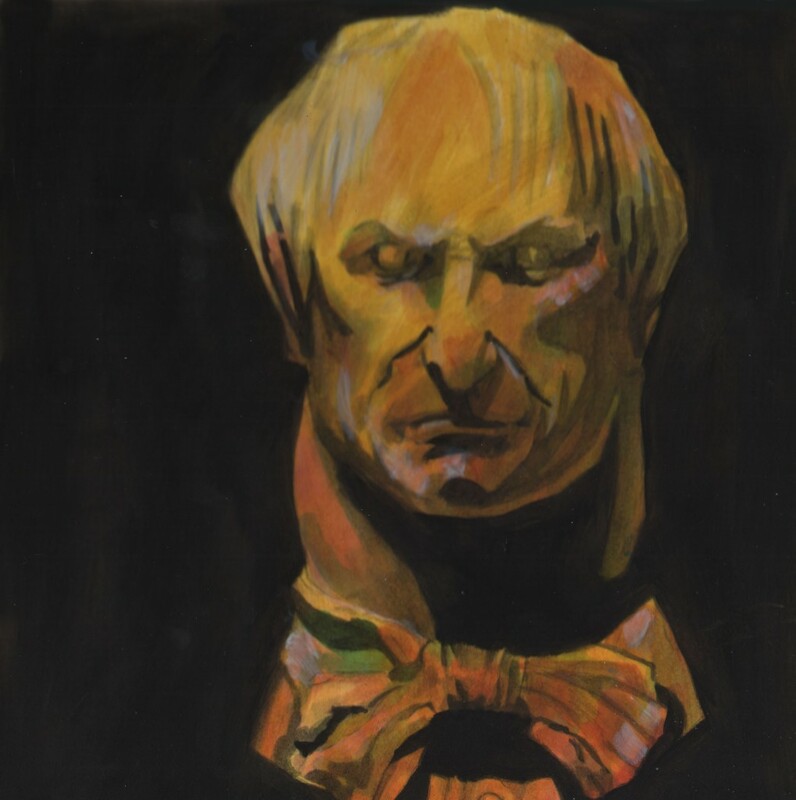 Here is the first painting I did in this painting style and it happens to be the other bust from the Haunted Mansion. 8″x8″ acrylic ink, colored pencil and oil paint. Both paintings are available for sale at $50.00 each.